Roses, as well as other deciduous shrubs, fruit and shade trees, and vines are available as dormant bare-root plants in late winter and early spring. Bare-root roses that have strong canes and a fresh-looking, well-formed root system are the ideal. Once you receive your roses, take care that the plants don’t dry out, keeping them out of direct sun and wind. Should bad weather prevent immediate planting, lay them in a temporary trench dug in a shady spot in the garden and cover the roots with moist soil. On planting day, soak the entire plant in water for an hour or two to be sure the roots and canes are full of moisture. Roses grow best in a sunny location and in well-drained soil; in areas with poor drainage, it’s wise to plant in raised beds. Clear an area about three by four feet and incorporate several inches of organic matter, such as compost, ground bark, or damp peat moss, into the top 18 inches of soil. 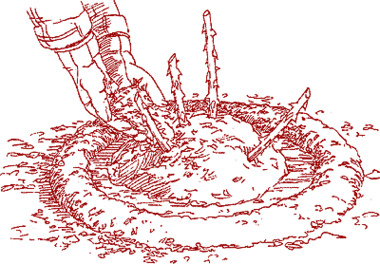 Make a mound of soil in the center of the hole to support the roots and crown of the plant. 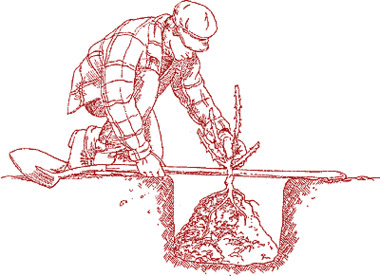 Set the plant in the hole, spreading the roots as evenly as possible over the mound. Most growers in cold-winter regions (USDA Zones 7 and below) position roses so that the bud union—the swollen or knobby part at the crown that gives rise to the canes—will be one inch below soil level. 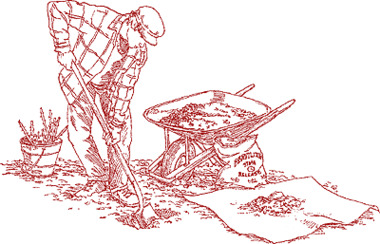 In warmer climates, set the bud union slightly above soil level. Hold the plant upright as you firm soil around its roots. When backfilling is almost complete, pour in enough water to fill the hole. This settles the soil around the roots, eliminating any air pockets. Let the water drain and then finish backfilling. Water once again. After planting, take care not to overwater newly planted and still dormant bare-root roses, since soggy soil may inhibit the formation of new feeder roots. Loosely mound soil over the bud union and lower few inches of the canes to protect them from sun, cold, and wind while the roots become established. Once the plants are growing well, they will require more water, but always check for soil moisture before watering. After planting, I usually mist the canes every day or two to help with breaking new growth. Especially when growing miniature roses.